"Gotham Footcare Rocks! What a phenomenal team." "My experience with Dr. Cunha was exceptional." "Best place if you have problems with your feet." " Dr. Cunha and his staff have always gone above and beyond to assist me!" "The staff is very friendly and attentive, the office is nice and clean." Gotham Footcare is dedicated to providing the most exceptional, state-of-the-art medical and surgical foot care treatments available. 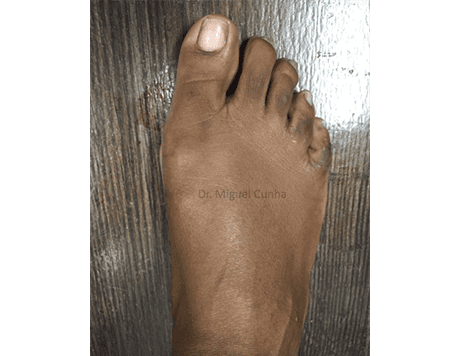 Under the direction of Miguel Cunha, DPM, a team of the best Manhattan podiatrists at Gotham Foot care serve patients from all surrounding areas at their offices in Downtown, Manhattan and Midtown, Manhattan, New York. They provide treatment and care for many foot conditions such as foot pain, bunions, arthritis, hammer toes, plantar warts, and more. Their philosophy is defined by providing a comprehensive diagnosis and treatment plan for every patient in a manner that is friendly, personal, and compassionate. To this end, they are committed to relieving your foot ailments effectively, efficiently, and comfortably. Gotham Foot care passionately pursues the health and well-being of their patients by providing the most sophisticated diagnostic, therapeutic, health-promoting, and preventative practices, with unrelenting attention to the individual needs of each patient. Their mission is to forgo a universal approach towards footcare. Instead, the team recognizes the individual needs and desired outcomes of each patient while formulating an effective and personalized treatment plan. The physicians at Gotham Footcare are committed to providing uncompromising excellence, both medically and surgically, in a safe, effective, and efficient manner utilizing their culture of compassionate care with exceptional service and state of the art technology. From routine checkups, athletic or work-related injuries, to treatments and surgery, Gotham Footcare focuses on all of your foot and ankle care ailments, with all the services you need to maintain happy and healthy feet. Gotham Foot care diagnoses and treats any and all conditions related to the skin, nerves, tendons, ligaments and bones of the foot. What sets Gotham Foot care apart from other podiatry offices is their dedication to providing you with the education you need to make well-informed decisions regarding your care. They strive at recognizing your individual needs and desired outcomes while formulating an effective and personalized treatment plan with the highest quality care available. Regardless of what your foot and ankle trouble may be, the physicians at Gotham Footcare will work tirelessly to help you feel better. Foot odor. Just the sound of those two simple words is off-putting, never mind the actual smell. Immediately your mind makes you think of sweat, cheese, vinegar. It's pretty gross. But, as gross as it may be, it's very common. Some women love wearing heels, some women hate it but do it anyway, some women don’t mind, and others just stay away from them altogether. Here's the scoop on heels from a podiatrist's perspective. In an effort to minimize out-of-pocket expense, we participate with most managed care plans and insurance providers. For any questions regarding insurance, please contact our offices. "Dr. Cunha is kind, takes the time to answer all my questions, and helps me find alternative solutions when my insurance doesn't cover what he first suggests." "The staff was extremely friendly their positive vibes were contagious! Dr. Cunha was great, he took his time to answer all of my questions." "Dr. Cunha truly cares for the well-being of his patients. He is extremely professional and knowledgeable." "Dr. Cunha was attentive, accommodating, and willing to answer any and all questions I had through my recovery process. I would highly recommend Gotham Footcare." "All of the staff are super friendly, energetic and efficient. Dr. Cunha is attentive and finds solutions quickly, offering more than one option for treatment." "Dr. Cunha is knowledgeable, personable and really cares about his patients. His staff is wonderful; They are always friendly and helpful."